I sometimes have to resize windows on my computer desktop before I can start working with them. That's usually the case when they open in a small window and I want them to take up more space, or if they open in fullscreen and I want to place another window besides them. 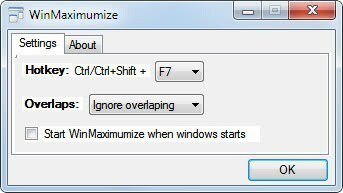 WinMaximunize is an application for Windows that can be of use to some users. The program basically offers to expand the active window so that it expands over all unused desktop space. The program works directly after it has been started on the system. The hotkey Ctrl-F1 is set as the default hotkey. Once it is pressed the active window will be resized to use all of the remaining space on the desktop that is currently not being used by another window. It is possible to change the default hotkey and whether overlaps should be ignored in the program options. The program has a few issues that need to be addressed. It does not work properly if the window is already in a maximized state. It is for instance possible on Windows 7 to move a window to the left or right border of the screen to make it use half of the available screen. Such a window cannot be maximized with WinMaxinumize even if the remaining screen space is blank. I also had to configure the application to ignore overlaps so that all free space would be filled with the selected window. Without the setting, a small border at the bottom of the screen would remain blank as well. It is possible that these two issues are only affecting Windows 7 users. WinMaximunize is an interesting application, and it would actually be nice if Microsoft would add the feature to its upcoming operating system Windows 8. The software requires the Microsoft .NET Framework 3.5, downloads are provided at the developer website.